And we have video proof that the mirror is making for some very successful tummy time. 2011 10 16 Reflections from Amanda Izquierdo on Vimeo. Dexter jazzin’ it up! What a fun video– had to watch it a few times. 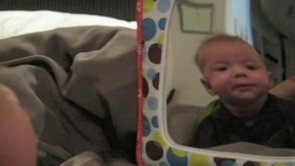 He really loves that mirror, LOL! The best, best, best video! well look who thinks he is just a cutee patutee. Love it.